Monthly Review – How Has 2019 Started For You? How has 2019 started for you? Don’t worry if it’s not quite gone to plan yet, you’re not alone! Coming up I’m going to share with you, how you can increase your focus, to help you achieve what you want and possibly have your best year so far! So, how has your 2019 started? 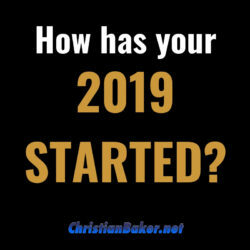 Click here to leave me a comment below the video and let me know how 2019 has started for you. If it’s started well great, let’s help you keep the momentum going and if it hasn’t, then let’s get you focused and on track, to ensure you’re doing everything you can to make it happen! At the end of the year I encourage you to hold a debrief with yourself, take some time to review how things have gone, what you’ve been grateful for, what you’ve enjoyed and what you’ve learnt. This is something I encourage you to do regularly, you can do it daily, weekly, monthly, quarterly, annually, or all these times. As It really does help to keep you focused and on track. So before you dive into the next month, take some time to review how the last months has gone for you. Now take that review to help propel yourself into the month ahead. I get my clients to commit to 28 days of focus, to choose a personal 28 day challenge, to focus on their main priority for the next 28 days. We are what we repeatedly do and everything we accomplish is as a result of our consistent actions. So, get clear on what you want to achieve, choose what you are going to do for the next 28 days to help you achieve it, commit to it and then make it happen! Imagine if you did this for every month of the year, imagine how much more focused you will be and how purposeful you will be with all your actions. There are so many distractions, don’t let yourself get caught up in the current of day to day life. Live you life with purpose and remember the more action you take the more progress you will make! It’s amazing how much progress you make with small consistent action in the right direction. Click here to leave a comment below the video and let me know what 28 day challenge you’re committing to and what you are looking forward to achieving! Thank so much for watching and please remember – What your mind believes you will achieve – so think differently, believe in yourself, take action and achieve the life you want!